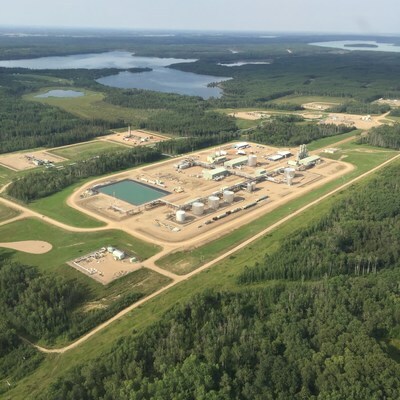 CALGARY, Jan. 8, 2018 /CNW/ – Osum Oil Sands Corp. (“Osum” or the “Company”), a private oil sands company, is pleased to announce the commencement of the Phase 2C expansion at its Orion Thermal Project (“Orion Project” or “Orion”), located in the Cold Lake oil sands region of Alberta. The Phase 2C expansion will be executed concurrently with the Phase 2B expansion that was announced in October 2017 and will be funded from cash on hand and with cash flow. When completed, the two phases will increase total production capacity to over 18,000 barrels per day. Osum is currently producing in excess of 9,000 barrels per day at the Orion Project. Osum also has regulatory approval for its 35,000 barrels per day Taiga Project, a greenfield development located less than twenty kilometers from Orion. Certain statements contained in this press release may contain projections and “forward-looking statements” within the meaning of that phrase under Canadian and U.S. securities laws. When used in this document, the words “may”, “would”, “could”, “will”, “intend”, “plan”, “anticipate”, “believe”, “estimate”, “expect”, “project” and similar expressions, may be used to identify forward-looking statements. Forward-looking statements in this press release may include, but are not limited to, statements regarding production from the Phase 2A expansion, timing and completion of the Phase 2B and Phase 2C expansions, the anticipated production from the Phase 2B, Phase 2C and Phase 2D expansions and the anticipated cost operating cost savings from the expansions. By their nature, those statements reflect management’s current views, beliefs and assumptions and are subject to certain risks, uncertainties, known and unknown, and assumptions, including, without limitation, assumptions about expected cash flows, expected production levels or conditions, and expected economic life of the Orion Project, retaining a high quality, experienced management and operating team, production delays, changing environmental and other regulations, the ability to attract and retain business partners, the ability to exploit hydrocarbon resources with available technology, the need to obtain and maintain proprietary rights over aspects of the technology, competition from other technologies, the ability to access the capital required for project development, research, technology development, operations and marketing, financial position, predictions of future actions or plans or strategies, changes in energy prices and currency levels. Many factors could cause actual results, performance or achievements to be materially different from any future results, performance or achievements that may be expressed or implied by these forward-looking statements. Should one or more of these risks or uncertainties materialize, or should the assumptions underlying the projections or forward-looking statements prove incorrect, actual results may vary materially from those described in this press release as intended, planned, anticipated, believed, estimated, projected or expected. Osum does not intend and does not assume any obligation to update these forward-looking statements whether as a result of new information, plans, events or otherwise, except as required by law. The Company’s securities are not traded on any stock exchange, and thus Osum is not subject to regulation by any Canadian stock exchange. Osum is not a reporting issuer anywhere in Canada and its securities are not registered under the United States Securities Act of 1933. As a result, the Company is not presently subject to the reporting, certification or other requirements imposed on reporting issuers in Canada or U.S. securities legislation including U.S. registered issuers under, among other things, applicable Canadian securities legislation or the U.S. Sarbanes-Oxley Act of 2002. This release is provided for information purposes only and shall not constitute an offer to sell or the solicitation of an offer to buy, nor shall there be any sale of the common shares in any jurisdiction (including the United States) in which such offer, solicitation or sale would be unlawful. SOURCE Osum Oil Sands Corp.